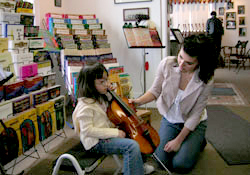 The String House offers violins, violas, and cellos in all sizes. The advantage of renting from The String House is that the student is supplied with a perfectly adjusted instrument. This will help them to learn to play as opposed to struggling with a poor quality tool that may be available elsewhere. We specialize in violins, violas, and cellos exclusively, so you can be assured of a superior sounding instrument as well as the service you deserve. Above prices covers all damages to the instrument, bow, and case and includes broken string replacement when changed in our shop. All instruments may be exchanged for a larger/smaller size as needed. Currently The String House can ship violins and violas to your address for an additional fee. Please call or email for rates.